The Tibetan Terrier is a medium-sized, squarely proportioned dog. The head is medium in size with a moderate stop. The nose is black. The teeth meet in a scissors, reverse scissors or level bite. A reverse scissors bite is where the inner surface of the lower teeth touches the outer surface of the upper teeth. The dark brown eyes are large and wide-set. The V-shaped ears are pendant, hanging beside the head. The topline is level and the chest has a brisket that extends down to the top of the elbows. The tail is well-feathered, curling up over the back. The back legs are slightly longer than the front legs. Dewclaws are sometimes removed. The double coat has a soft, woolly undercoat with a long, straight to wavy, fine, profuse outer coat. The coat comes in all colors and patterns. A brave, intelligent, dedicated, medium-sized dog. Sweet, loving and gentle, the Tibetan Terrier is lively, mild and fun, with great agility as well as endurance. Be sure you are this dog's pack leader. 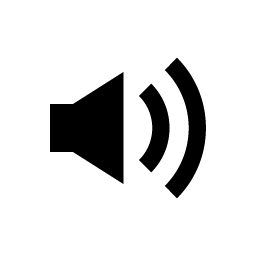 Dogs that are allowed to run the show, believing they are alpha to humans will become willful and may begin to bark more than you wish them to, as they try and control things, telling you what THEY want YOU to do. This breed's bark is deep like a rising siren. While they do make a good watchdog, Tibetans that bark a lot need to be told enough is enough. After it first alerts you, tell your dog to quiet down. You can handle things from here. If the dog believes he is your leader, rather than the other way around, he will get upset when you leave him. Instinctually, pack leaders are allowed to leave the followers, however followers are not allowed to leave the pack leader. Will do well with children so long as the entire family is pack leader. As soon as the dog begins to question the order, he may not be trustworthy with young kids and may become reserved with strangers as he tries to assess this role among humans. He may also try to dominate other dogs. Tibetans that have firm, confident, consistent pack leaders and that get enough mental and physical exercise will be wonderful, trustworthy family companions. 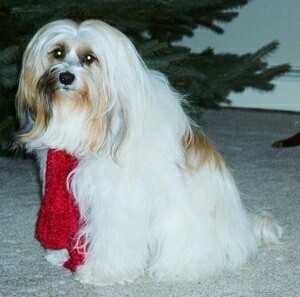 In the United States, Tibetan Terriers' bloodlines vary in terms of height and coat. Check with the breeder about any particular litter's genealogy. Height at the withers of over 17 inches or under 14 inches is considered a fault. This breed can be very flea sensitive. Also prone to progressive retinal atrophy (PRA) and hip dysplasia. The Tibetan Terrier will do okay in an apartment if it is sufficiently exercised. It is relatively inactive indoors and a small yard will be sufficient. 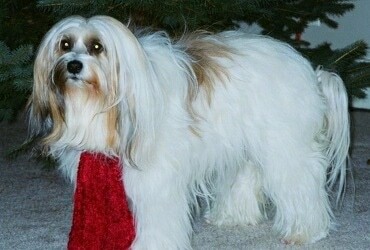 The Tibetan Terrier has lots of energy and the dog should have regular opportunities to run. In addition, it needs to be taken on long daily walks. The Tibetan Terrier requires an extensive amount of grooming and should be brushed every 2-3 days to remove loose hair and prevent tangles. Never brush a dry coat; mist it with conditioner and water to ease brushing. Pay extra attention beneath the leg joints, the beard and the hindquarters. The dog should be given regular baths—once every week or two. Remove excess hair from the ear passages. Clip any build-up of hair between pads of the feet. If the dog is not going to be shown, it can be clipped short, especially in the summer. Although they are considered non-shedding they do shed somewhat on a yearly basis but not daily. 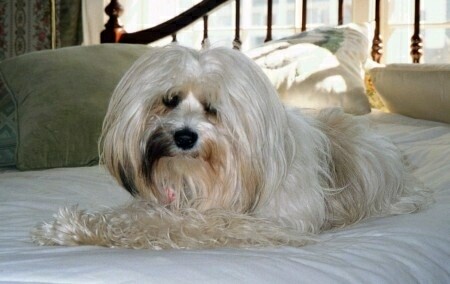 The Tibetan Terrier is good for allergy sufferers when its coat is kept very well groomed. This is an ancient breed that has contributed to the development of all other Tibetan breeds, including the Shih-Tzu, Lhasa Apso, and the Tibetan Spaniel. The Tibetan Terrier is not actually a terrier at all. They were originally kept by Tibetan Monks almost 2,000 years ago and were considered good luck charms. The monks refused to sell them, but often gave them as gifts. In the 1920s, Dr. A.R.H. Greig of England was working for Women’s Medical Service of India and was given two of these dogs, one by a patient for performing a successful operation and the other by the Dalai Lama himself. Dr. Greig bred the two dogs and brought three of them back home with her where she continued to breed them, establishing a Tibetan Terrier kennel in England. The dogs were originally registered as Lhasa Terriers. 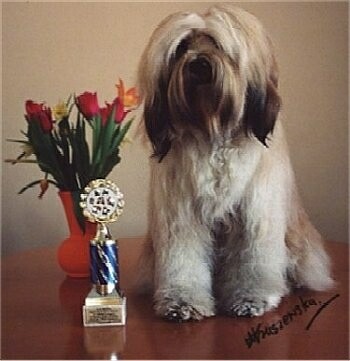 In 1930 the Indian Kennel Club changed the name of the breed to Tibetan Terrier. In 1956 Dr. Henry and Mrs. Alice Murphy of Great Falls, Virginia, imported the first Tibetan Terriers into the USA and later got them recognized with the AKC in 1973. Some of the Tibetan Terrier's talents include: being a watchdog, agility and competitive obedience. 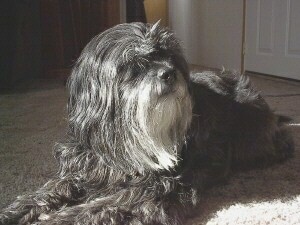 Samantha the Tibetan Terrier—"She loves everyone, even the vet and her dog groomer. She has lots of energy and keeps us busy, even at 9 years old." 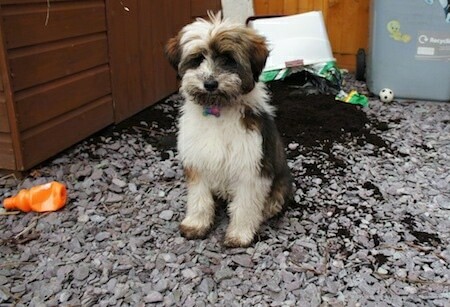 Barney the 6-month-old Tibetan Terrier caught in the act! "Oh no, Barney, what have you done?!! Look what my Tibetan Terrier did tsk tsk tsk...and how does he react? He blames it all on the cat."